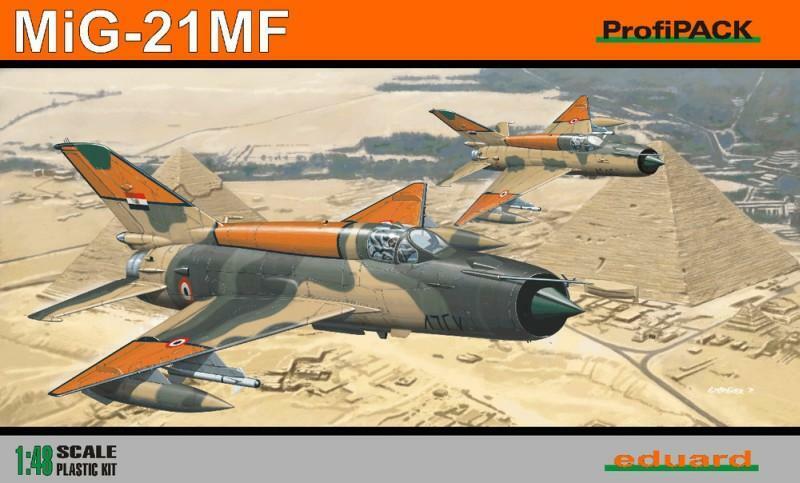 MIG-21 MF, FULL DETAIL EDITION. MIKOYAN-GUREVICH COLD WAR ERA, DELTA WING SUPERSONIC JET FIGHTER, UPGRADED 3rd GENERATION SM AND EXPORT VARIANTS. KIT HAS ENGRAVED PANEL LINES, HIGHLY DETAIL COCKPIT AND WHEEL WELLS, EXHAUST PIPE WITH TURBINE AND AFTERBURNER ELEMENTS , OPTIONAL POSITION SPEED BRAKES AND CANOPY. SEPARATE FLAPS AND AILERONS, RATO PODS, DIE -CUT MASKS, RESIN PARTS (UB-16 ROCKET LAUNCHERS x2) AND PHOTO-ETCHED PARTS (INCLUDING COLOR INSTRUMENT PANEL AND COCKPIT DETAILS). ALSO HAS AMPLE EXTERNAL STORES: 800L DROP TANK, TWO EACH - 490L DROP TANKS, S-24 ROCKETS, FAB 250 BOMBS, MISSILES (RS-2US, R-3S, R-13, R-3R) PLUS EIGHT 100 BOMBS. DECALS AND COLOR PAINTING GUIDE FOR 6 AIRCRAFTt: EGYPTIAN AF No 7628 OF AN UNKNOWN UNIT, 1988; CZECHOSLOVAK No 9712 OF THE 9th FS, 1989; SLOVAK AF No 7713 OF THE 4th FLIGHT, 1999; POLISH AF No 7809 OF THE 10th ESKADRA, 2001; RUSSIAN AF No 127 OF THE 812th UAP, AUGUST 1991 AND EAST GERMAN No 687 OF THE JAGDFLIEGERGESCHWADER 3, 1990 - INCLUDES FULL STENCIL DATA.